An Opera in Flatland: A Novel. By Steve Tomasula. Art and Design by Stephen Farrell. University of Chicago Press, 9780226807409, 370pp. 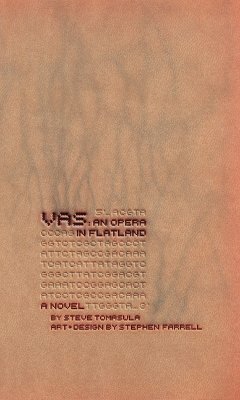 Printed in the colors of flesh and blood, VAS: An Opera in Flatland—a hybrid image-text novel—demonstrates how differing ways of imagining the body generate diverse stories of history, gender, politics, and, ultimately, the literature of who we are. A constantly surprising, VAS combines a variety of voices, from journalism and libretto to poem and comic book. Often these voices meet in counterpoint, and the meaning of the narrative emerges from their juxtapositions, harmonies, or discords. Utilizing a wide and historical sweep of representations of the body—from pedigree charts to genetic sequences—VAS is, finally, the story of finding one's identity within the double helix of language and lineage. "This constitutes a leap forward for the genre we call 'novel.' Collapsing nonfiction into fiction, women's reproductive concerns into men's, history into present, work into play--this novel takes juxtaposition and digression to new heights." "A tour de force of narrative typography." "Reading VAS, I felt pushed a bit higher above our own cultural Flatland, an experience both disturbing and enlightening, and one for which I am grateful." "Typographically inventive. . .and visually brilliant—incorporating photos, illustrations, diagrams, charts, and graphic art—VAS: An Opera in Flatland redesigns the novel, taking it to a dimension beyond the one in which it ordinarily lives." "A hybrid of fiction, biotechnology, science studies, the history of biology, aphorisms and even a touch of the comic book. . . . VAS is a welcome and innovative contribution to the ongoing discussion and debate on biotechnology and the posthuman, principally because it invents a unique grammar for engaging with the complex issues presented by biotechnology."